USES: This medication is used to treat the first outbreak of genital herpes infection. It is also used to treat non-life-threatening herpes infections of the skin and around the mouth (cold sores) in people with a weakened immune system. This medication may decrease the length of time you have pain and help the sores heal faster. Acyclovir is an antiviral drug. It stops the growth of certain viruses. This medication does not cure herpes or prevent the infection from coming back. Also, it does not prevent the spread of herpes to others. Other antiviral medications taken by mouth may be more effective in treating these conditions. Discuss your treatment options with your doctor. HOW TO USE: Apply this medication to skin only. Avoid getting this medication in your eyes. If this happens, wash immediately with plenty of water. 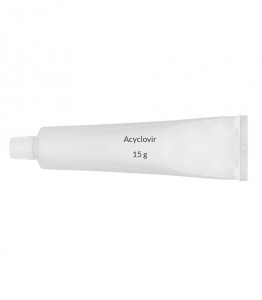 Begin using acyclovir as soon as symptoms of a herpes infection appear. Wash your hands with soap and water before and after using this medication. Clean and dry the affected areas before applying the medication. Use a finger cot or rubber glove when applying acyclovir to prevent spreading the infection to other parts of your body and to other people. Apply enough ointment to cover all sores, usually every 3 hours, 6 times a day, or as directed by your doctor. Continue to use this medication for the full time prescribed. Tell your doctor if your condition does not improve after 7 days of treatment or if it worsens. SIDE EFFECTS: This medication may cause mild, temporary burning or stinging when you apply it. If either of these effects persists or worsens, tell your doctor or pharmacist promptly. Remember that your doctor has prescribed this medication because he or she has judged that the benefit to you is greater than the risk of side effects. Many people using this medication do not have serious side effects. A very serious allergic reaction to this drug is rare. However, get medical help right away if you notice any symptoms of a serious allergic reaction, including: rash, itching/swelling (especially of the face/tongue/throat), severe dizziness, trouble breathing. This is not a complete list of possible side effects. If you notice other effects not listed above, contact your doctor or pharmacist. In the US - Call your doctor for medical advice about side effects. You may report side effects to FDA at 1-800-FDA-1088. In Canada - Call your doctor for medical advice about side effects. You may report side effects to Health Canada at 1-866-234-2345. PRECAUTIONS: Before using acyclovir, tell your doctor or pharmacist if you are allergic to it; or to valacyclovir; or if you have any other allergies. This product may contain inactive ingredients (such as polyethylene glycol), which can cause allergic reactions or other problems. Talk to your pharmacist for more details. Before using this medication, tell your doctor or pharmacist your medical history. Before having surgery, tell your doctor or dentist about all the products you use (including prescription drugs, nonprescription drugs, and herbal products). Cold sores can spread easily. Avoid close physical contact with others (such as kissing) during an outbreak until the cold sores have completely healed. Try not to touch the cold sore. If you do, wash your hands afterward. To lower the chance of giving genital herpes to your partner, do not have sexual contact during an outbreak or if you have symptoms. You can spread genital herpes even if you do not have symptoms. Therefore, always use an effective barrier method (latex or polyurethane condoms/dental dams) during all sexual activity. Consult your doctor or pharmacist for more details. Tell your doctor if you are pregnant before using this medication. Discuss the risks and benefits with your doctor. It is unknown if this medication passes into breast milk. Consult your doctor before breast-feeding. Avoid breastfeeding if you have herpes sores on or near your breast. NOTES: Do not share this medication with others. Wear loose-fitting clothing over your herpes sores to keep from irritating them. Cold sore outbreaks can be caused by many factors such as stress, hormonal changes (such as pregnancy, menstrual period), injury/surgery on the mouth (such as dental work), tiredness, sunlight, cold weather, or fever/cold/flu. Talk to your doctor about identifying and managing these triggers.